The Japanese JSR Corporation and Bangkok Synthetics Corporation (BST) have created a joined venture (51%/49%) in June 2011 called the JSR BST Elastomer Co. to build the first Solution Polymerization Styrene-Butadiene Rubber (S-SBR) plant in Map Ta Phut, Rayong Province, Thailand. S-SBR is a high-performance synthetic rubber used mainly in tires and industrial goods for which the global demand for S-SBR for use in fuel efficient tires has been growing rapidly in recent years. The schedule of this second phase will be adjusted according to the development of the fast growing automotive industry in Thailand. 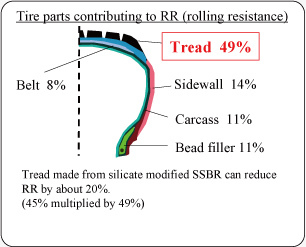 S-SBR is mainly used in the tire tread of automobiles to reduce its rolling resistance (RR) . The tread is the only part of the tire which comes into contact with the road’s surface, and contributes to break performance (gripping power) and fuel efficiency (rolling resistance). The rolling resistance of a tire has an impact of approximately 15% on fuel consumption, of which the tread has an impact of approximately 50%. cash advance loans . This pill gives a hand to thousands who suffer from erectile dysfunction. People who take Viagra Super Active can forget about their impotence and have a normal intimate life.